Holmes took the sisters to the Union Stock Yards, where a tour guide led them into the heart of the slaughter. The guide cautioned that they should watch their feet lest they slip in blood. They watched as hog after hog was upended and whisked screaming down the cable into the butchering chambers below, where men with blood-caked knives expertly cut their throats. The hogs, some still alive, were dipped next into a vat of boiling water, then scraped clean of bristle — the bristle saved in bins below the scraping tables. Each screaming hog then passed from station to station, where knifemen drenched in blood made the same few incisions times after time until, as the hog advanced, slabs of meat began thudding wetly onto the tables. Holmes was unmoved; Minnie and Anna were horrified but also strangely thrilled by the efficiency of the carnage. 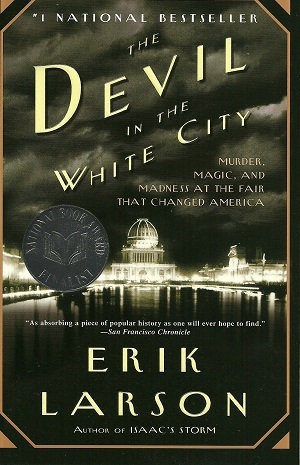 The yards embodied everything Anna had heard about Chicago and its irresistible, even savage drive toward wealth and power. I was so struck by this passage that it was one of only two in the entire book that I made a note of. Did Chicagoans in the late nineteenth century really take young ladies out to the slaughterhouse on a date? As anyone who has been inside such a place will testify, they are truly horrifying. And yet Minnie was Holmes’s “wife” and Anna a newly-met sister-in-law. Despite the stench and pools of blood, the Union Stock Yards were Chicago’s single most compelling attraction for visitors, and tour guides did indeed lead men and women into the heart of the operation. It seems likely that Holmes would have brought Minnie and Nannie there, partly because of the yards’ status, partly because he would have derived a certain satisfaction from subjecting the women to its horrors. “It seems likely . . .”? This will not do. Larson’s passage describing the visit is entirely made up, based on pure speculation. We don’t even know if Holmes ever visited the Union Stock Yards, much less what his reason would have been for bringing these two women on such a tour, or what their response would have been (“horrified but also strangely thrilled”?). Yes, it makes for a colorful passage with heavy thematic overtones (Holmes would run his own slaughterhouse in Chicago, where little would go to waste), but it’s a bit of writing that has no place in such a book.